Actually, there's not much to show you. The first week of December was mild, with frosts at night but 40s during the day. The garden still looked pretty good. Week two we got hit with a hard freeze. For days we had lows in the teens and highs not getting out of the 30s. What didn't freeze wilted from the cold. While much of the rest of the northern hemisphere was getting buried in snow, the third week of December here brought only a few stray flakes coming down. Then Thursday we woke up to a freezing rain which coated everything with a thin, slippery layer of ice. Those aren't snowflakes in the photo above, they're raindrops freezing on the way down. The flash caught them coming down. We're still getting plenty of fresh vegetables though. I harvested the last of the broccoli right after the plants froze. There was enough for a broccoli, dried cranberry, and toasted almond salad. Next spring we're likely to get another growth of it, and then I'll collect broccoli seeds. 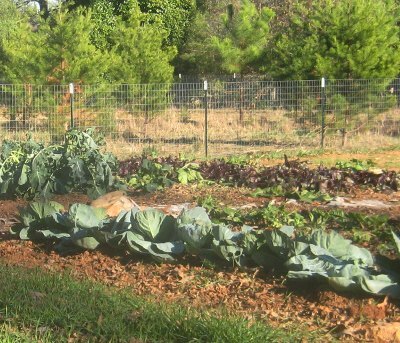 I also harvested the frozen cabbage heads (sauteed cabbage and onions, yum!). Then there are still fresh turnips, beets, and carrots to harvest as long as the ground isn't frozen solid. We've eaten a lot of turnips; diced and roasted with potatoes mostly, or mashed with potatoes. I've also made several yummy batches of sauerruben. I remembered to mark a few turnips in the garden to let flower and go to seed. These will be saved for next year's seed. Having all these plus the Swiss chard and salad greens has meant that we've used very little of our pantry stock, except when we want some variety. Annual rye in the sunlight. Lastly our winter green manure. 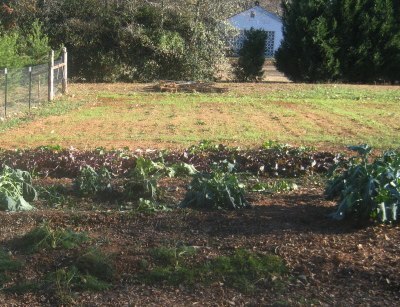 We planted annual rye is at the far end of the garden, where we tilled in the chicken litter. It's only coming up sporadically, thanks (I think) to our $1 seed spreader. Maybe we don't have the hang of it yet! Still, my gardening philosophy is that something is better than nothing. Leigh...Your garden looks the same as mine. Question for you though. I have broccoli in the ground that is "flat-lined" like yours. It sounds like you're saying that I can leave it in the ground and it might bounce back this spring? What can I expect? Thanks! City Sister, "hopeful". Yes, that's the perfect word to describe it! Theresa, yes I need to dust off that loom. I have a first grandbaby due at the end of April and need to do some baby blanket weaving! Tami, I based that on what I did last year. I left my fall garden in the ground all winter (broccoli, beets, turnips, spinach, onions, lettuce), and everything went dormant. However, it all started to grow again in the spring. In fact, I had planted my broccoli so late that the only harvest I got was the following spring. As the weather got warmer everything pushed to make seed, all of which I saved of course. :) You and I are in the same planting zone I believe (7?) so it should work for you too. Give it a try as an experiment. Gosh I love fried cabbage and onion! 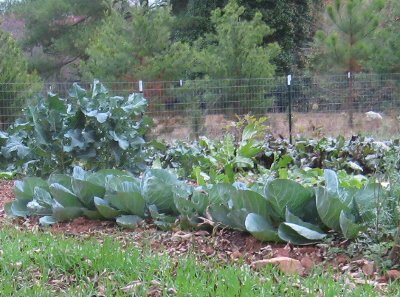 I have never grown cabbage before, but intend to this coming year. Just got my first seed book in and I have so many things marked up already! Fun!! Mr. H, unfortunately, we're more likely to get freezing rain here than snow, although we can get quite a git of snow. The ice storms are the worst, usually with widespread loss of power and quite a bit of damage as well. Nina, any chance of getting those leeks anyway? If they're frozen could you do something with them? Diana, I have to confess that I've not had the best of luck with cabbage. Yet. It's one of those challenges that I'm going to conquer! Any variety I should watch out for? Do you have heat or bug problems? Yes, heat and bugs both. I think that's why my spring planted cabbages don't do so well. I do have cabbage moths, but have found Pyola spray from GardensAlive! to be effective. For varieties, I'm experimenting with types good for sauerkraut. I have Dutch flat in the garden now and thought they didn't make huge heads, they are wonderfully tasty. I'm going to order some Brunswick seed and see how they do. I'm hoping that if I get my spring seed started in January, I may get a spring harvest! 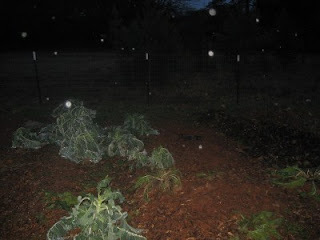 So sad to see the frozen garden, but then you surprized me by mentioning starting cabbage seeds next months. And the whole circle will begin once again. Congrats to all your hard work, and enjoy the litteral fruits from your labor.